Figure 12.2. Early demyelinated lesions in cerebellar white matter. Luxol fast blue/H&E stain. For full caption, see page 260. Figure 12.3. Cerebellar folia: Granule cell loss with underlying demyelination. For full caption, see page 261. Figure 12.6. JCV protein expression revealed with double-label immunocytochemical staining for early (T antigen) and late (capsid) proteins. For full caption, see page 269. Figure 12.7. JCV protein expression revealed with double-label immunocytochemical staining for late (capsid) proteins and glial fibrillary acidic protein (GFAP). For full caption, see page 271. Figure 12.8. Double immunocytochemical label for GFAP and JCV capsid proteins (no counterstain). JCV-containing cells occur in the margins of the mature, gliotic demyelin-ated lesion and in the incipient lesion below the gliotic lesion with minimal astrocyte reactivity, but with numerous JCV-infected cells, including some with astrocyte morphology. Astrocytes with capsid located cytoplasmically are seen in the lower right corner and are enlarged in the inset. Figure 12.22. Astrocytes and PML pathogenesis. (A) Small cluster of enlarged, reactive astrocytes in the subcortical white matter of an early PML case discovered at autopsy (Astrom and Stoner, 1994). Cells display GFAP reactivity (red), but no JCV-infected oli-godendrocytes with capsid proteins (black) were evident. Method same as in Figure 12.2C. An adjacent section stained with LFB/H&E showed no evidence of myelin destruction (not shown). These astrogliotic clusters were the earliest discernible PML lesions. No counterstain. Medium magnification. Taken with permission from Astrom and Stoner, 1994. 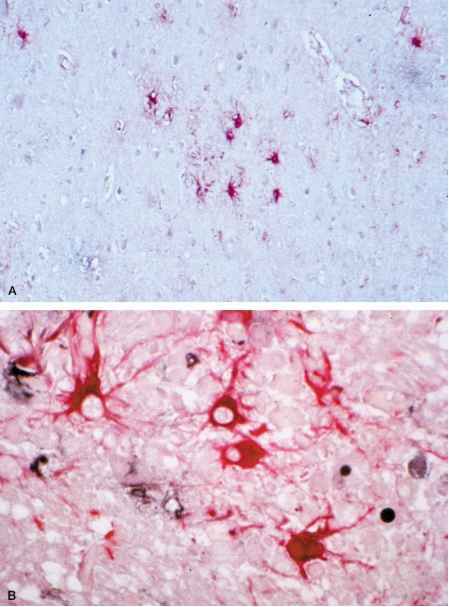 (B) Established lesion in the basal ganglia with reactive astrocytes (red), including one with apparent perinuclear JCV capsid proteins in the cytoplasm (lower right). This cell extends a process to an infected oligodendrocyte with JCV capsid proteins in the nucleus (black). No counterstain. High magnification. Permission to reproduce this image online was not granted by the copyright holder. Readers are kindly requested to refer to the printed version of this chapter. Figure 15.3. Induction of neural origin tumors by JCV T antigen in experimental animals. (A) JCV T antigen transgenic mice develop peripheral neuroblastoma, which can present as a solid, well-circumscribed mass, in the abdominal cavity (arrow). 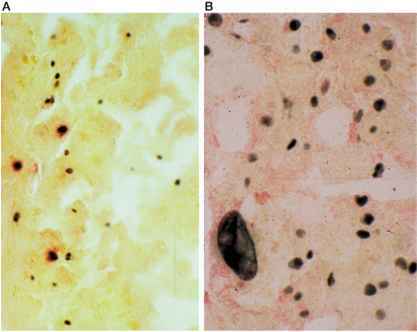 (B) Neuroblastomas are histologically characterized by densely cellular neoplasms with a high nuclear to cy-toplasmic ratio. (C) The majority of the nuclei show immunoreactivity to the viral protein T antigen. (D) Transgenic mice generated with sequences forT antigen under the control of the JCV archetype promoter develop cerebellar medulloblastomas within the foli® (arrow). (E) Histologically, the tumors appear similar to neuroblastoma. 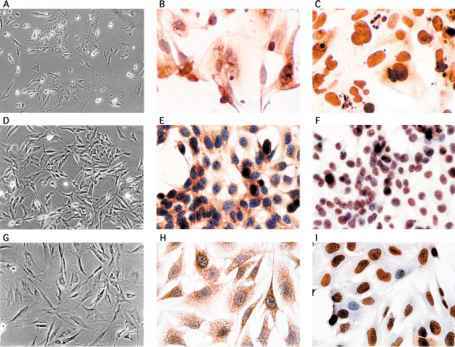 (F) JCV T antigen can be detected by immunohistochemistry in tumor cell nuclei. 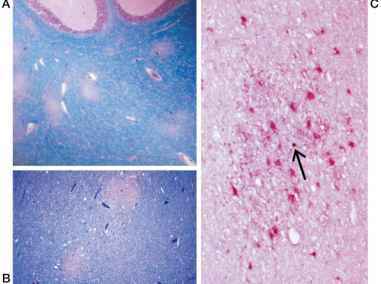 (G) T antigen transgenic mice may also develop pituitary tumors, which appear as large masses at the base of the skull (arrow). 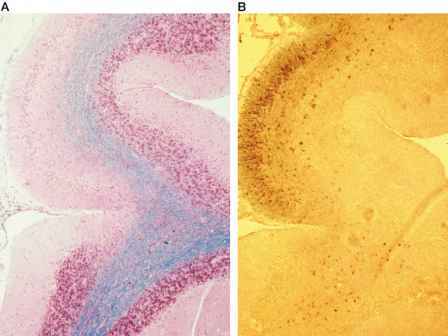 (H) Histology demonstrates a highly pleomorphic tumor (left) adjacent to normal pituitary (right). (I) Tumor cells show nuclear staining for JCV T antigen. (J) JCV-transformed HJC cells transplanted into the brain of syngeneic Syrian hamsters form an intracranial mass that can protrude through the superior aspect of the skull (arrows). (K) A clear line of demarcation is present between the highly cellular pleomorphic cells (left) and the surrounding normal brain parenchyma (right). (L) The majority of the tumor cells express nuclear T antigen. A, G, J, original magnification, x4; D, original magnification, x10; B, E, H, K, hematoxylin and eosin, original magnification, x100; C, hematoxylin counterstain, original magnification x100; F, L, hematoxylin counterstain, original magnification x200; I, hematoxylin counterstain, original magnification x400; D. Taken with permission from Krynska et al., 1999. Figure 15.4. 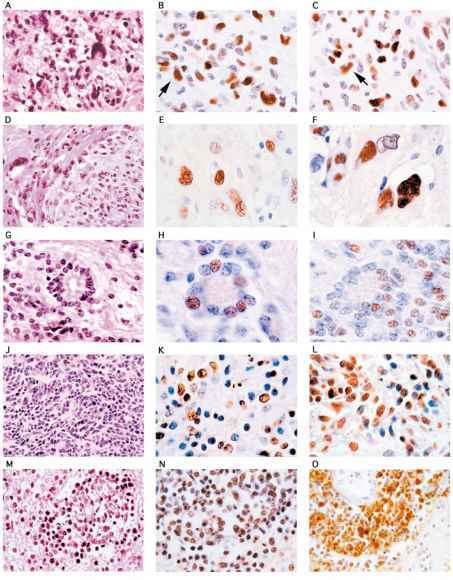 Morphologic features of cells derived from JCV-induced tumors in various experimental animals. (A) Phase microscopy of the glioblastoma cell line Owl 586 generated upon intracerebral inoculation of an owl monkey with JC virus. 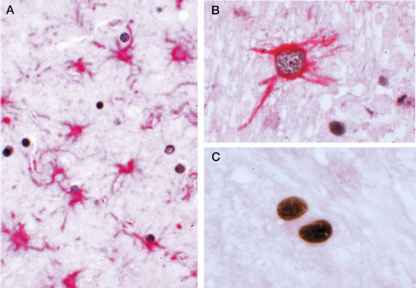 (B) Immunostaining with the cellular marker GFAP demonstrates that the tumor is of glial origin. (C) Immunostaining for JCV T antigen shows that the majority of the cells express T antigen in the nucleus. (D) HJC cells cultured from a tumor induced upon intracerebral injection of JCV into newborn Syrian hamsters shown by phase microscopy. (E) HJC glial cells are positive for GFAP. (F) Nearly all of the cells express JCV T antigen. (G) Phase contrast of BS-1 B8 cells derived from JCV T antigen-induced mouse medulloblastoma. (H) Synaptophysin staining of BS-1 B8 cells demonstrate the neuronal origin of the tumor cells. (I) The majority of the tumor cells show nuclear immunoreactivity for JCV T antigen. Figure 15.5. Detection of JCV T antigen and the cellular protein p53 in human glial origin tumors. Histologic evaluation and immunohistochemistry for JCV T antigen and the cellular tumor suppressor protein p53 in a number of human glial tumors is shown: oligodendroglioma (A, hematoxylin and eosin staining; B, immunohistochemical staining for T antigen; C, immunostaining for p53); gemistocytic astrocytoma (D-F); fibrillary astrocytoma (G-I); anaplastic oligodendroglioma (J-L); anaplastic astrocytoma (M-O). 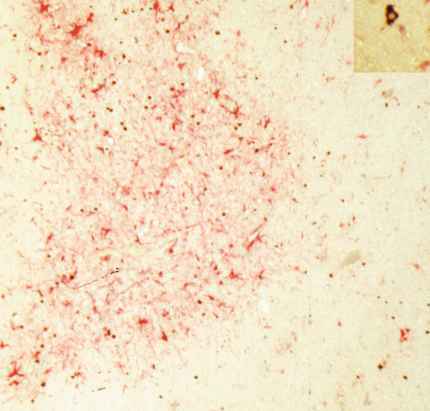 A, D, G, J, and M, hematoxylin and eosin, original magnification, x400; B, C, E, F, H, I, K, L, N, O, hematoxylin counterstain, original magnification, x1000. Figure 15.6. Immunohistochemical staining of various human tumors for T antigen expression. JCV T antigen has been detected in a variety of human tumors. 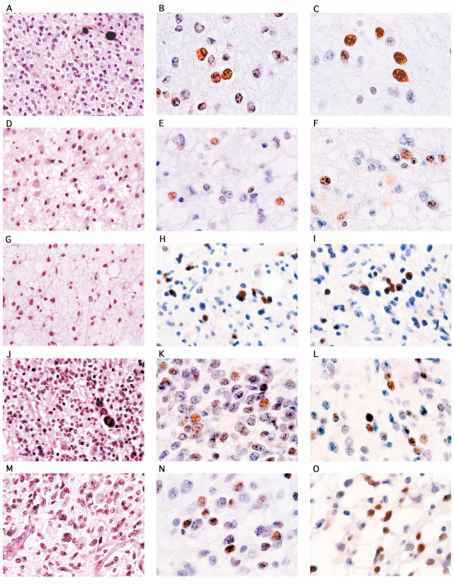 Histology and immunohistochemistry for T antigen and cellular proteins are shown for the following tumors: glioblastoma multiforme (A, hematoxylin and eosin staining; B, immunohistochemical staining for T antigen; C, immunostaining for p53); gliosarcoma (D-F), ependymoma (G-I), medulloblastoma (J-L), B-cell lymphoma (M, hematoxylin and eosin staining; N, immunohistochemical staining forT antigen; O, immunostaining for the EBV protein latent membrane protein [LMP]). A, D, G, J, and M, hematoxylin and eosin staining, original magnification, x400; B, C, E, F, K, L, N, and O, hematoxylin counterstain, original magnification, x400; H and I, hematoxylin counterstain, original magnification x1000. Human Polyomaviruses: Molecular and Clinical Perspectives.